Following the TBEX travel bloggers’ conference, I was thrilled to join a press trip with three other bloggers and Vikki our excellent organiser and host. Several detailed articles are in the pipeline but in the meantime, this is how our trip began. 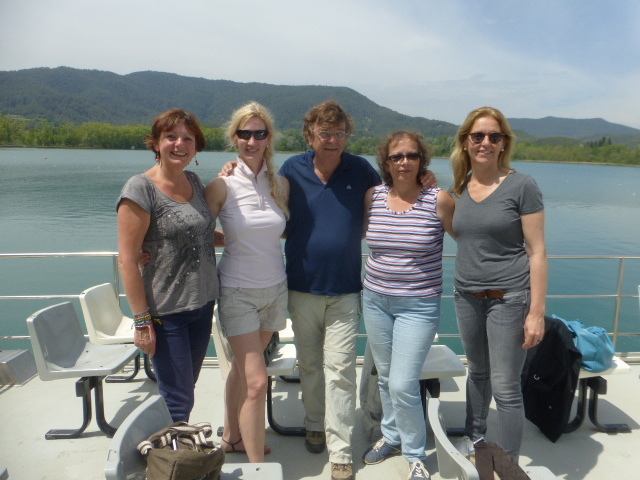 After a walk along the coastal footpath which skirts Lloret de Mar our little group went by coach to the lake at Banyoles where we boarded a boat for a trip around the lake. We ate lunch in the sun and we learnt a little bit more about the region of Pla de L’Estany from Txell who lives in Banyoles and who was to join us for a day or so. 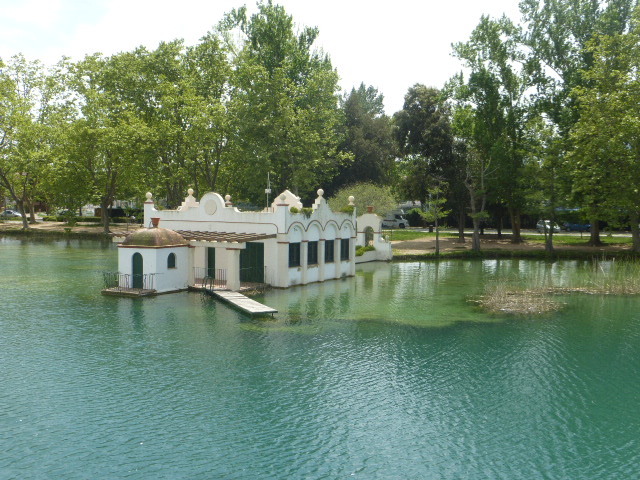 The boat was electric which therefore reduced both noise and fuel pollution on the water; and which happened to be the lake that was used for the rowing events when Barcelona hosted the Olympics. As we glided around the incredibly green lake looking at the little fishing houses which were dotted around the water’s edge we could see the Pyrenees in the distance; some of which still had snow on their tops, and cyclists and joggers were riding or running around the perimeter path. The lake measures 6650 metres around the perimeter, it has an average depth of 15 metres and it is 132 metres at its deepest. Rowing, canoeing, swimming, kyaking and triathlon all take place on the water. Fishing is permitted but all fish must be returned live to the lake. The little fishing houses were built as bases from which the rich could come and fish at weekends and during the holidays. Bicycles can be rented in the town of Banyoles and there are 10 different routes of varying difficulties in and around the area. After our ever so relaxing boat tour which was a lovely way to ease into the trip and to get to know each other, we went on to the quaint little town of Crespia. Not a lot was happening when we were there, although once a year they host a honey fair when the place comes alive. We left Crespia to its own devices basking quietly in the sun and we hiked a short way out of the village and up a hillside to a cave. 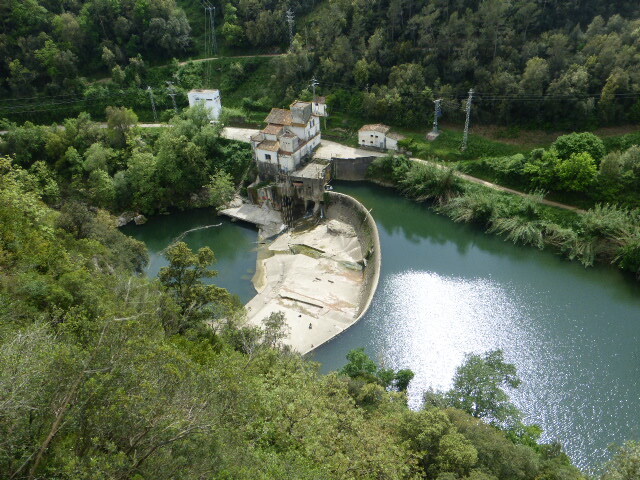 From the cave we had views down over a river which had been dammed to form a small reservoir and today, just a small speck sitting cross-legged under the dam wall was a drummer playing a kettledrum and a lady who was moving and dancing to the music. The sounds floated gently up to us as we looked around the little shrine of Sant Miquel de la Roca with its little nativity figures arranged on a rock shelf in one corner and we peered out through the windows which had been carved out of the spiky grey rocks. Can you spot the tiny figures down on the dam? Leaving the village behind, dazzling yellow fields of rapeseed lined the roads, whilst in the fields that contained grass or cereals, swathes of poppies bobbed and nodded to the sun, their scarlet petals sometimes more prolific than the green grass that they had taken up residence in. 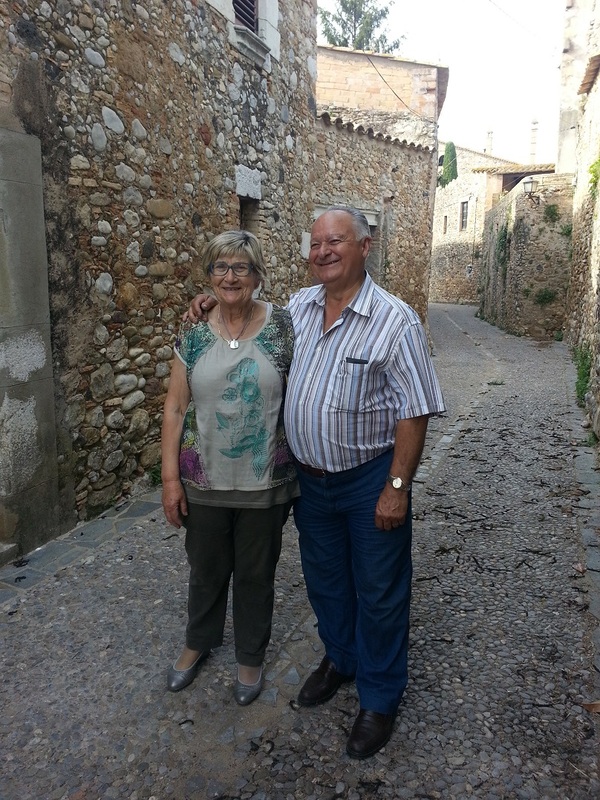 Our next stop was to visit the home and vineyard of Joaquim Reig and Montserrat Torrens. Joaquim and Montserrat harvest the grapes manually and produce a red wine from their 2000 vines, usually producing 2200 litres annually. 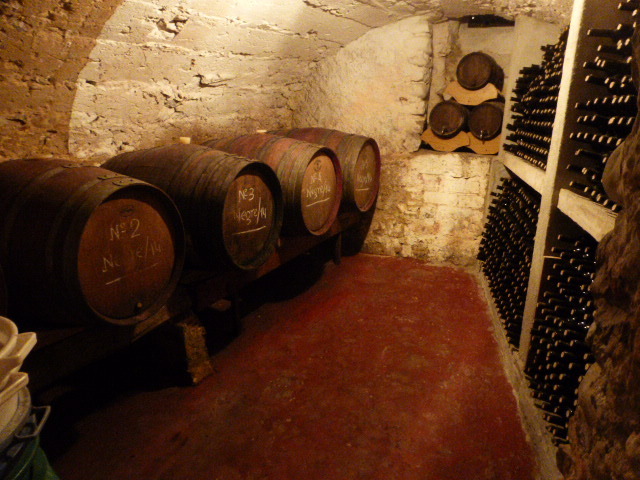 The wine is mainly sold to local high end restaurants in Girona, although some makes its way to Belgium and the Netherlands. Incidentally this is the only vineyard in the immediate region, and the oldest vine is currently about 30 years old although the farm has been producing wine for much longer than that. 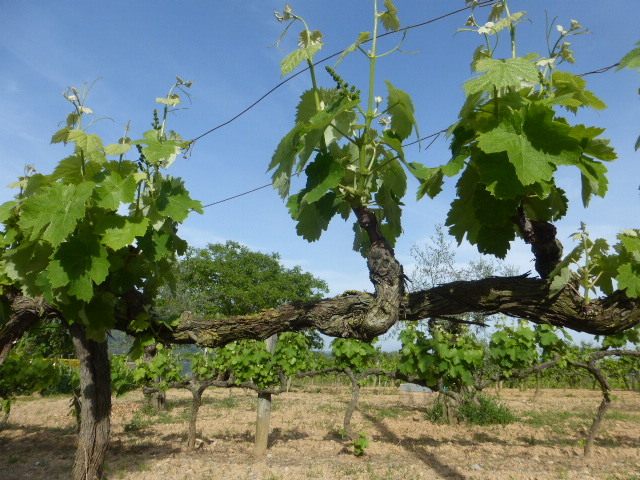 I was interested to learn that the vines don’t suffer too much from fungal diseases, mildew or insect attack – due to the geography and the prevailing winds which blow from the north. The winds are dry and cool and ‘clean’ the air, the land and the vines and prevent many problems which plague other vineyards. Joaquim has been producing wines as a business venture for the last 12 years since his retirement, when he increased the time that he was able to dedicate to his hobby. He joked that he could have spent the same amount of time and the same money in that time playing tennis or golf – but of course he would not have had any wine to drink! The Baronia de Vilademuls wine sits in the barrel for a minimum of 10 months and is traditionally drawn off the sediment during March at a time of a new moon or no moon. When it is time to bottle the wine, 4 people work side by side to fill, cork, label and pack and they can turn around an impressive 500 bottles an hour. A large barrel sits in pride of place which predates 1957 and which once belonged to Joaquim’s grandfather and is another link to the past in a place where even the walls of the house remind you of what had gone before. When Joaquim’s family decided to extend the cellars beneath their farmhouse they discovered old cellars which had previously been sealed up; although they already knew that knew that their home was inextricably linked to the ancient castle which once stood in the village, because their farmhouse had been built into and around the original stone walls, incorporating the history of the village into the fabric of their lives. Their village was an old settlement which had a substantial castle dominating it as far back as the 10th century. At that time, the owner of the castle killed the son of the lord who lived in the next village. In revenge, the lord came and attacked the village, demolishing the castle and then he and his army covered the stones with salt. This action would normally have prevented the castle from being rebuilt because the salt would ruin the stones, however, the revenging lord had not factored in that the cleansing wind would blow the salt away and clean the stones. 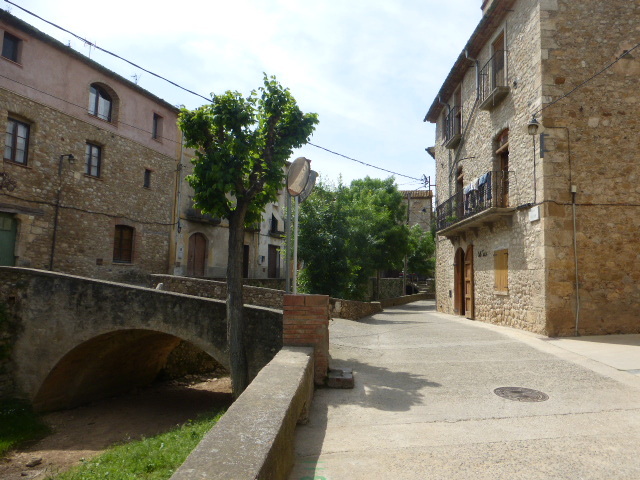 300 years later, in the 13th century the descendants of the villagers rebuilt their houses using the old castle stones. Despite the dry atmosphere and the winds, to this day the villagers complain that they have problems with damp and humidity in their houses, and they believe that this is a legacy of the salt in the old castle stones. After looking around the vineyard and the cellars it was time to taste. We sat in a room with a barrel arched ceiling made of bricks and tiles while Montserrat served us with good wholesome tomato bread, a selection of meats and ham, cheeses and olives – and of course their wine which was certainly delicious. If you want to make yourself one of the staples of the Catalan diet, it couldn’t be easier. Lightly toast some decent rustic bread from a country loaf. Rub liberally with a clove of garlic and then with half of a cut tomato until the juice has all been absorbed into the toast. Serve plain with just some salt or olive oil to taste or top with chorizo, ham, cheese, roasted aubergines and/or anchovies. Our trip around the Pla de l’Estany area continued for another two days when we were introduced to the sheer diversity of the region. It is jam packed full of history, awesome scenery, wonderful hotels and food and drink to die for. Catalunya certainly has something for everyone; whether you are visiting as a family, a couple or as a solo traveller. To discover what happens at a pairing dinner with a strambolic painter, learn where you can visit prehistoric caves and a neolithic village and to read about the hotels and the food and drink in the region, sign up and make sure that you don’t miss my future articles. Useful to mention that it is North of Barcelona – perhaps include a small map for context . . .